I’m here and back from a little funk. 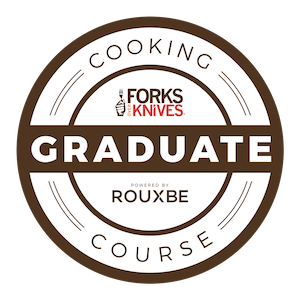 It’s been a crazy week with ups and downs and I just haven’t been too inspired in the kitchen and wanting to disconnect a little. But ready to head into a new week, I hope. Friday we celebrated our wedding anniversary at Seasons 52, a classy restaurant that focuses on a seasonal menu. 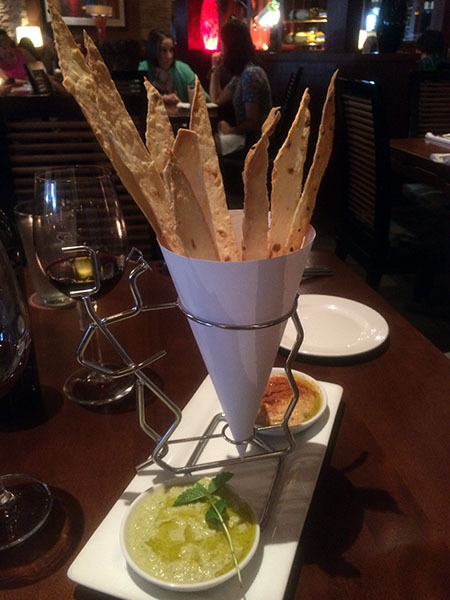 We started with the flat bread hummus appetizer with mint edamame and spicy pepper hummus. The presentation was impressive. The mint hummus was especially tasty and unique and I’m already thinking about recreating it. I got the summer sampler plate for my main dish which could be served vegetarian or vegan, I went vegan of course. It was loaded with a summer citrus quinoa salad, black bean taco, cedar plank tofu, and roasted veggies. And much prettier than non-vegan plates I must say with more flavors. The taco and tofu were my favorites on this plate with a nice level of spice, but the whole dish was wonderful. 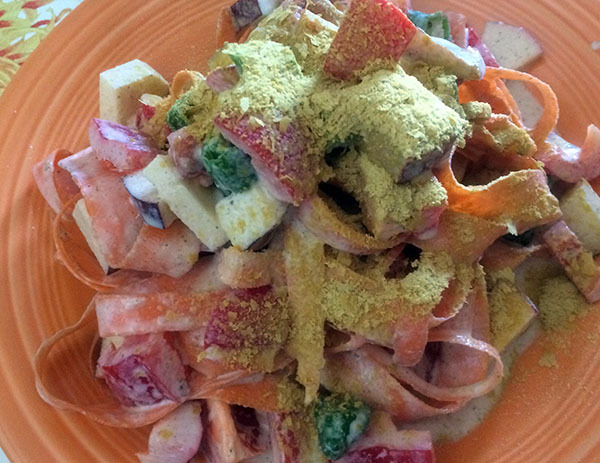 Yesterday I threw together a simple salad for a post-workout lunch with chopped apple and orange ginger hemp dressing. I wasn’t the only one with a serious case of the blahs yesterday, my sisters, mom, and I had an opportunity to get together without kids, but could not decide what we wanted to do. How sad is that? We blamed it on end-of-summer blues and ended up exploring Old Town Sacramento browsing shops and activities and heading to The Plum Cafe for dinner since my gift card from last weekend was burning a hole in my pocket and it was a fabulous dinner! 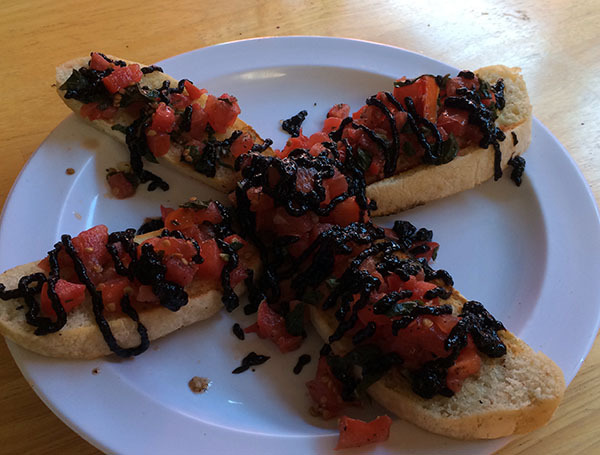 Instead of ordering entrees, we ordered appetizers to share and sample starting with the bruschetta. It was great with a creamy and tangy balsamic drizzle and kicky garlic. 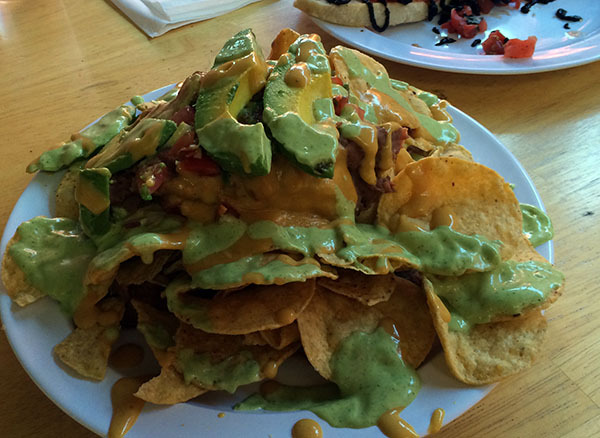 And of course the nachos plate because I’m addicted to nachos from The Plum Cafe! 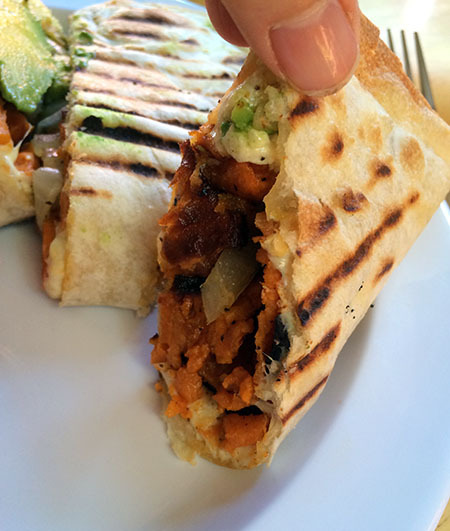 Finally the sweet potato quesadilla loaded with avocado and hearty vegan cheese. Genius using a sweet potato blend, these were so thick, hearty, and filling. And I’ve got ideas turning to create a healthier version, hmmm… I really adore dishes from The Plum for vegan comfort food at great prices and their generous use of avocado in these, wow! It was a weekend of fabulous splurge eating and I’m feeling rejuvenated to get creative in the kitchen this week and start upping my running miles as I consider training for another half marathon for Team Veg. Every single meal in this blog looks delish! 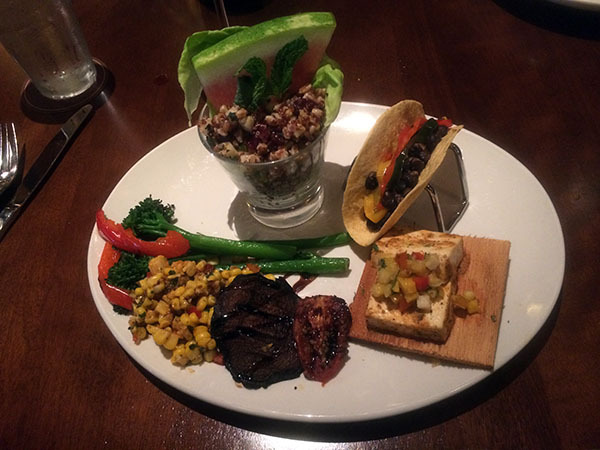 Thanks for sharing and looking forward to trying Seasons 52 sometime in the near future. Yeehaw! 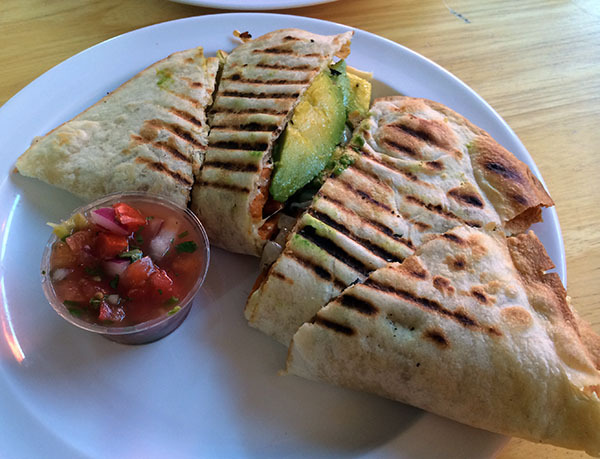 Thanks, it was a great weekend of eats and I’m already craving that quesadilla again!